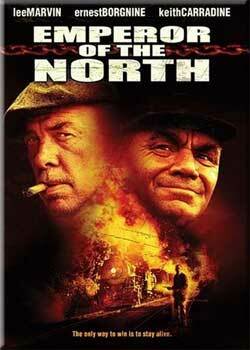 Set on the Pacific Northwest railways at the height of the depression, Emperor of the North pits a crafty, train-hopping drifter called A-No.1 (Marvin) against Shack (Borgnine), the cruel, bum-intolerant conductor of Engine 19. But when pride turns their determination into obsession, the clash escalates into a fight-to-the-finish that only one man can survive! Oscar winners Lee Marvin (The Wild One) and Ernest Borgnine (Marty) face off in an epic battle of wills in this riveting thriller "full of outrageous challenges, impossible predicaments and improbable escapes! (The New York Times) Directed by Robert Aldrich (The DIrty Dozen), and boasting "gripping action-packed suspense [and] one of the most spectacular fights in a long time, Emporer of the North is one helluva film!" (Genesis). Closed captions. Widescreen. Dolby 5.1. Award Value: 66 Points Earn points for free DVDs. Signup free. Enrique Herrera (San Jose, Costa Rica) on 2010-10-29 07:18:47. An excellent and classic movie. 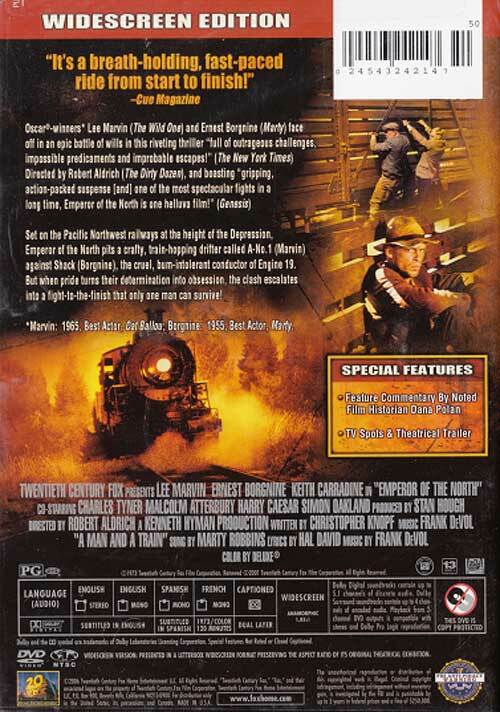 Not only does it have a good plot, it shows history of times gone by and has incredible shots of trains performing different maneuvers/operations (from normal starting/stopping to emergency starting/stopping including switching, coupling/un-coupling, sanding, taking on water and engine operation). It is also extremely interesting to see tricks used by both sides of the plot: ones to avoid free rides on trains and ones to get free rides on trains. Would kids enjoy this? Yes. Recommend to others? A "Must Have"! JOHN M (east grand forks mn) on 2012-04-08 09:05:40. Very good movie, story line etc all very high quality. Also a "clean" movie that could be shown to family. Not like some of the films made now where swearing etc seems to make some of these new actors feel they are "talented"
charles (yucaipa ca) on 2011-09-10 17:24:05. Good movie however the lords name was used in vain a little too much.